I’ve had it in mind for months to make a baby sized version of my Three Flocks design. My starting point was a lovely print from Leah Duncan’s collection called “Morning Walk” that I picked for the backing. I guess I am literally working back-to-front, but it works for me! The print is so charming and subtle–I love that it hints at floral but is still a simple geometric pattern. I took my palette for the flying geese from the print’s muted primary colors and added some salmon, peach and aqua. My original “Three Flocks” quilt has three big triangles made of decreasing rows of flying geese triangles. 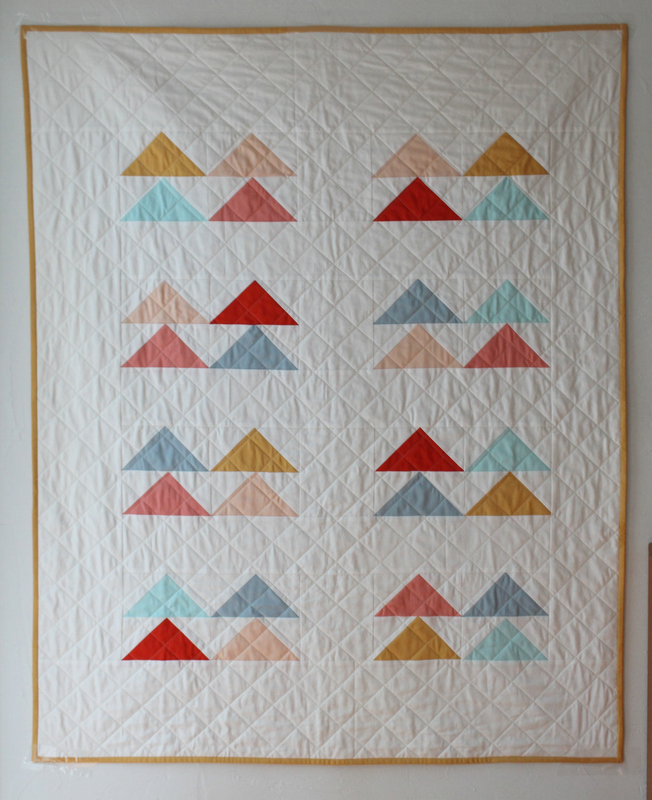 I knew that I would only have two “flocks” in a baby size quilt, and would have one less row in each big triangle. Once I had all my triangles made and ready to arrange, I discovered the design just didn’t look right in the smaller frame of the crib size quilt. Something about having two big triangles made the design feel sort of heavy. I think that old design theory–things are always better in odd numbers–must be right! Or maybe not, the design I ended up with has eight blocks of four triangles–nothing odd about that. This layout seemed to fit the size of the baby quilt better and gave a little more breathing room for the colors. The binding is Kona Ochre, also used as one of the triangle colors. I played around with different options for the binding (including some patterns! ), but I really like the warmth of the ochre. I can’t resist adding this picture that includes the newest member of our family–Olive! I’ve added this quilt to my Etsy shop! 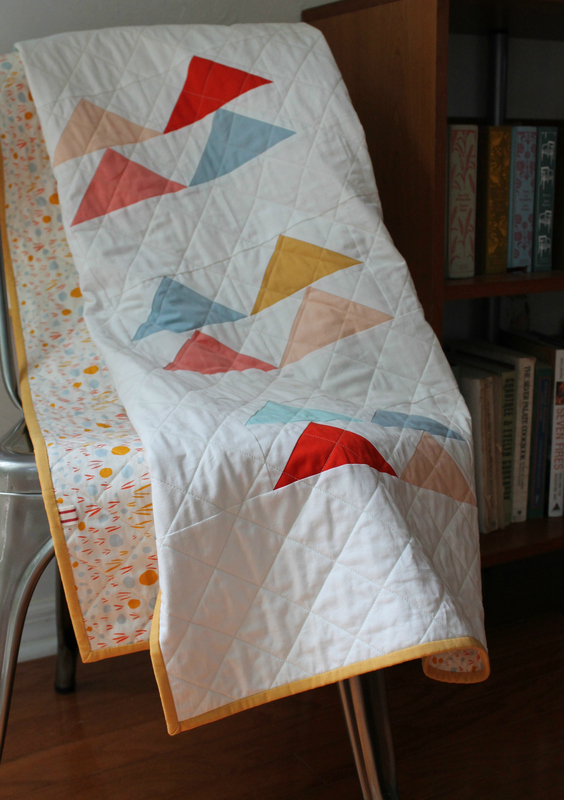 This entry was posted in fabric, inspiration, pattern, quilts and tagged flying geese quilt, geometric quilt, leah duncan, modern baby quilt, modern quilt design, morning walk on May 19, 2015 by brigitdermott. Olive is so pretty! 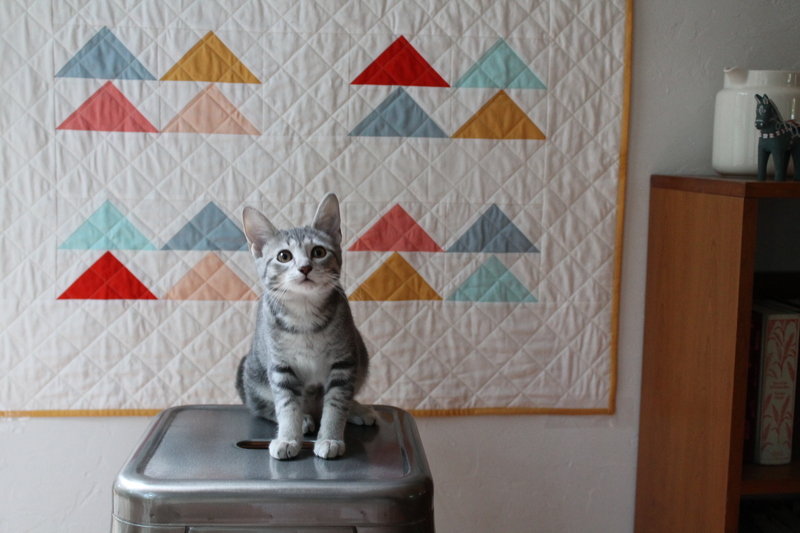 As is your 4 x 8 baby quilt–your palette is perfect. Looks are deceiving–she is quite pesky, but so adorable we forgive all her hijinks.